Me and my two sons drove up from LA on Saturday hoping to scrounge a walk in permit for Sunday. To our surprise and delight there were still permits available for Saturday. This gave us an extra night in the mountains and made it a solid week of solitude. We picked up our final supplies and headed to the Kearsarge Pass trail head. We started in around 4:00 PM, with only the desire to gain some altitude and find a good place to camp. We hiked for about ninety minutes, laboring under heavy loads and stopped at a flat spot near Gilbert Lake. We'd gained about 1,200 feet so it made for a good chance to adjust to the thinner air. Sunday we were on the move by 9:00 and arrived at the pass around 11:00. The weather was clear, warm and gave no hint of afternoon storms. We cruised down the backside of the pass and stopped about a quarter mile east of Bull Frog Lake. There is a shaded patch of sand overlooking a meadow that serves as a reasonable campsite. We had planned on splitting the trip into Vidette Lakes Basin over two days. Despite the extra night, we stuck to the same schedule. This gave us the chance to bag Mt. Rixford. Craig had soloed up the rock strew slopes back in 2008 and both of us set off around 1:30. 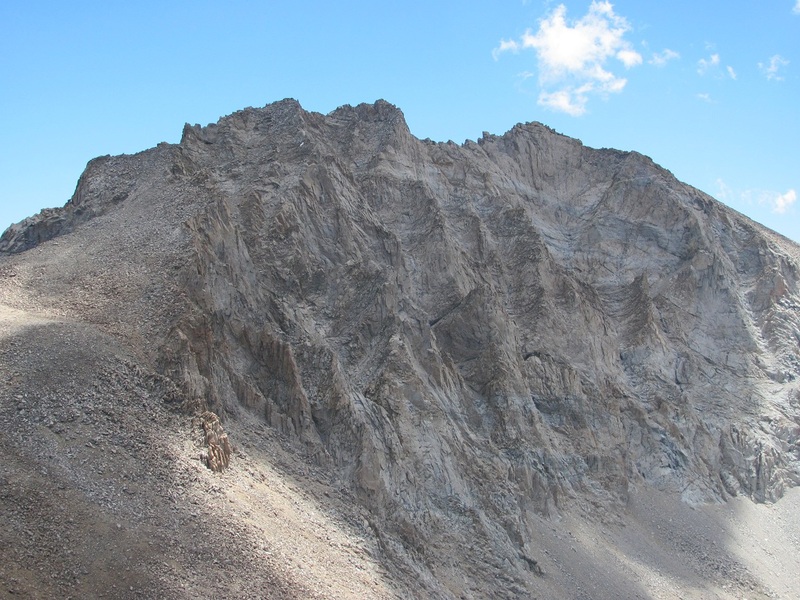 The hike to the final summit ridge is a classic mix of sandy, loose scree. The last three or four hundred feet is pretty fun climbing. Interesting black rock, a couple easy class three moves and a great summit made it well worth the effort. We were hoping for a sandy slope to trot down, but unlike a lot of similar peaks, such opportunities were pretty limited. We made the round trip in about four and a half hours. We were expecting deer in the meadow, but possibly the general dryness of the year had them looking for grass elsewhere. We settled in for dinner. I splurged on weight this year, making my first cooked meal of green curry with fresh onions, peppers, coconut cream and sliced beef! It was a great meal, but not worth the weight next time. We were carrying a tent in case of rain, but tonight like every night, we slept under the moon and stars. Monday was just a moving day, and not a very long one. We packed up and moved down the John Muir trail toward our back country crossing into the Vidette Lakes Basin. We crossed the river further south than the standard spot near the old cabin. We followed a faint use trail up to about 10,000 feet then gave up looking for it. We stayed on the left side of the valley and bushwhacked through grass, thickets and sized medium talus. We found a camp site just north and a little below the first lake at 10,400 feet. There was only a trickle of water running in the stream which fed a couple small pools in the meadow. There were a few trout in the pools, but it looked like their prospects for living out the summer were not great. After a really dry winter the meadow was drying out and I figured the trickle of a stream would soon be gone. From the saddle south east of Deerhorn climb talus east and south until gaining the broad ridge. Continue south up steep talus toward an obvious false summit that is split by a notch. 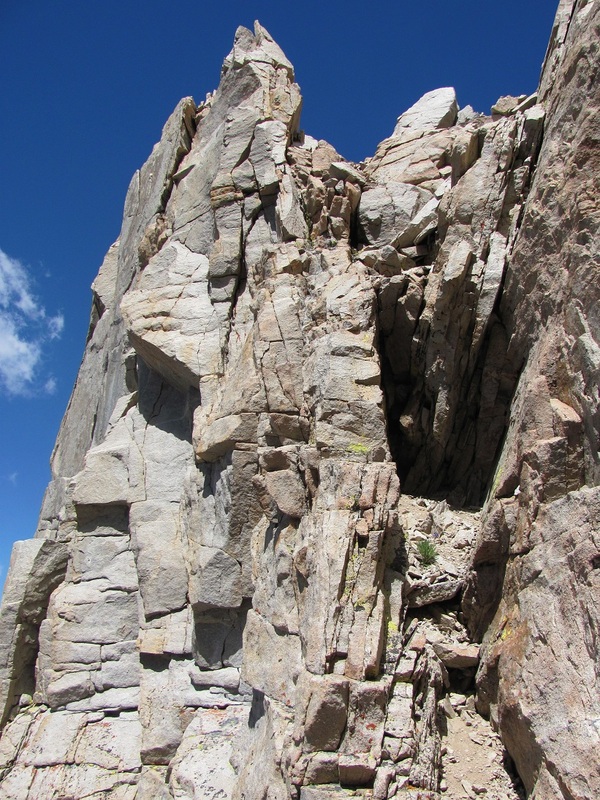 Climb through the notch and descend about fifty feet down a narrow scree chute to a ledge. Follow the ledge to the right and south around a corner into a shallow bowl or face. Climb class two and three up slabs and ledges toward another obvious false summit high on the right side of the face. Once you gain this peak, the rest of the route can be seen. 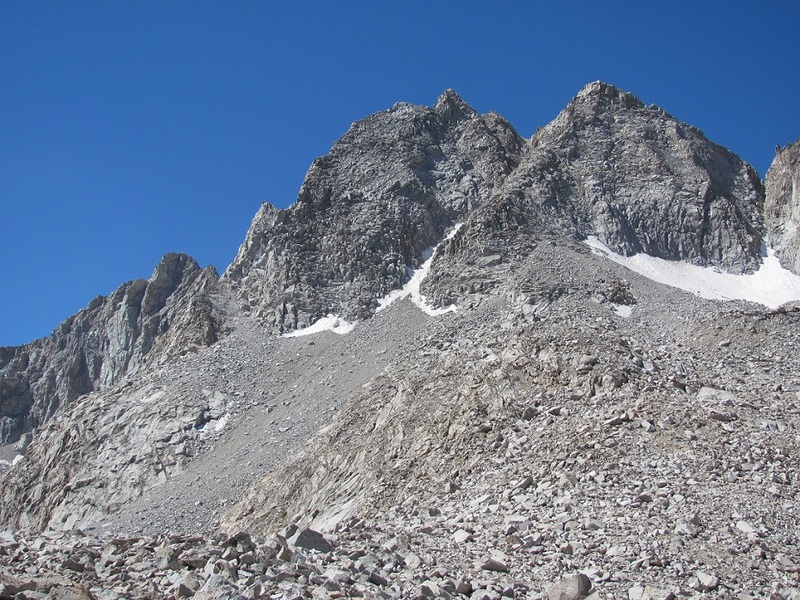 Follow the exposed, narrow ridge toward a spire. Pass the spire on its left (east) side. This ridge crossing is class two with a move or two of class three. It's a beautiful, airy traverse. After the spire you can gain a ledge of blackish rock by down climbing just a few feet. Follow the ledge around the north-west side of Stanford's final summit. The ledge leads around to a tall, dark, vertical chimney. Climb class three up to this chimney's base, then move left to a second chimney composed of reddish rock. Climb first in the chimney until you are forced out to the left onto a narrow rib of rock. This last pitch of thirty feet is very exposed and counts as the crux of the climb. It may rate as forth class. From the top of the rib, climb easier class three around to the east side and up to the summit. I was a little sad to summit alone, but delighted to have finally climbed Stanford after wanting to for so many years. 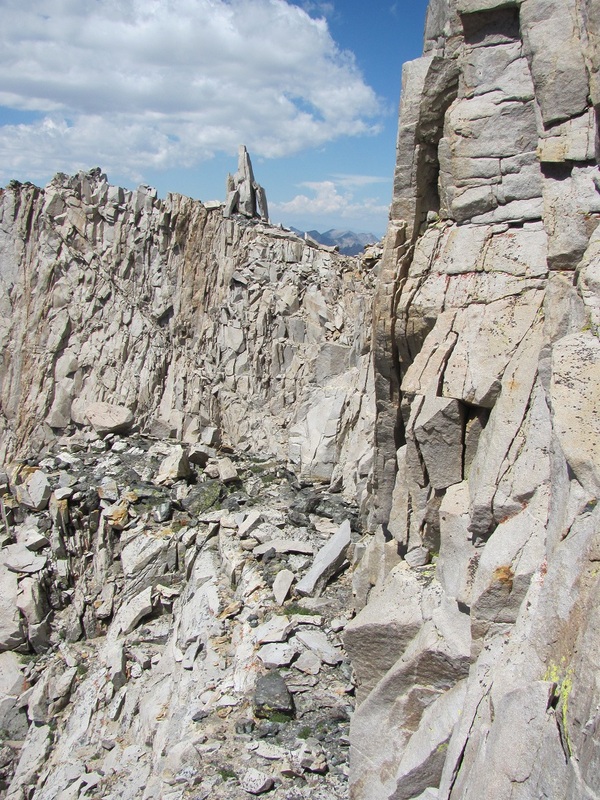 If you can stand the long approach from Vidette Lakes this is an excellent climb on an esthetic and challenging route! The summit register was rolled into a PVC pipe container. After a simple log in, I carefully retraced my route and was back at the saddle to join Julian by 4:00 PM. We managed to find sandy scree for a quick decent back to the interminable talus field. After that it seemed the day would never end. Both of my heels were screaming with blisters and I was dead tired. Ascending big talus when you're fresh and descending it when you're beat are two different animals! We finally reached our meadow and walked into camp just after 7:00. It was a great day and I was able to get some good views of the route on Deerhorn. I would rest Wednesday and be ready to try the North East Buttress route on Thursday. The sun does not hit this valley until around 9:00 am, so our lazy rest day got off to a slow start. Washing, eating, sleeping, hanging out and chatting were the big tasks of the day. The weather had changed slightly and we started seeing more clouds. After we went to sleep a few rain drops fell, prompting us to quickly set up our three man tent. No storm materialized and even though we left the tent up for the next two days, none of us would use it. We've really gotten use to sleeping under the Sierra sky. Thursday morning I was up at 5:30 heating water. Craig and I wanted to summit and then get down off Deerhorn early in the afternoon if possible. We were on the move by 7:00 and, already having made one round trip to the upper basin, made good time. We were climbing up the nose of the buttress by a little after 10:00. The first bit climbing up the base of the rib is loose shale and class two. Once we got on the ridge proper the climbing is fun and sustained. Most of the moves are class three, but the ridge moves up in steps so there is little if any serious exposure. We hit a tough patch just before the traverse down to the notch between the north and south summits. I climbed up and down the pitch a couple of times to test the moves, but Craig opted out at this point. He made a little perch and waited for me. After this pitch, the route works up to the left, rounds a bit of a corner and then you make an easy down climb to the notch. From the notch I continued to down climb around to the base of the south summit. I stayed on the far left side of the face and climbed to a sandy notch just north of the summit. At this notch there is a minor peaklet that you pass on its right. You can then climb ledges up to your right and to the final summit block. I was on the summit by 12:30. It was clouding up some but nothing serious. There was a new summit register in an old ammunition box. 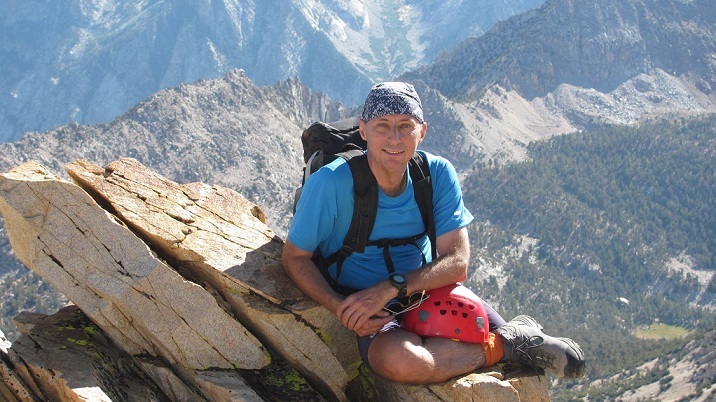 I signed in, noting it was my forty-eighth Sierra summit and that Deerhorn fell on my 51st birthday. I clambered back to down to Craig's perch and we worked our way back to the loose rocks on the nose of the ridge. At this point we saw some sandy scree off to our left, which looked like it would make an easy exit. This was probably a mistake. It took us forever to work our way down through a long uneven talus field to get back to our earlier starting point. In the end, it took us as almost as long to descend as we had spent climbing up. Anyway, I have to say this is great route on a remote mountain. It has a seductive shape that beckons to be climbed. Once climbed, the climber is rewarded with an awesome, tiny and exposed summit. Once again, if you can stand the long bushwhack and talus approach, it's a great climb. Dark clouds filled the sky that evening but again, no storms for us. Thursday was over and my summit dreams for 2012 we're "bagged and tagged". Friday was moving day. We left camp around 11:00 and found a better use trail heading down than the one we used coming up. The trail stays high on the north west side of the valley and crosses Bubbs Creek by the little cabin. We hiked back up to Bullfrog Lake where we stopped for lunch before continuing over Kearsarge pass and down to a campsite near Flower Lake. After being alone in a remote valley for the past five days, it was a little odd to be back amongst the campers and fishermen. The water in the brook smelled like fish and was full of suds. Not great, considering we never filter. Drink up! The next morning Craig told us he waited six hours after Julian and I started drinking before he dared. I guess we played the role of the King's water testers! Saturday morning was a rush. We had to be back in LA by 1:00 PM to pick my wife up at the airport. We were up early and back at the trail head by 8:15. Once again, the Sierras gave us a wonderful respite from phones, emails and work. To be able to spend time with my boys in such an untamed and wonderful wilderness is a fantastic privilege. These mountains intoxicate. I admit my addiction and am seeking no cure!